I had this thought that, ever since the middle of April, things have been in slow downward step-down. Not a downward spiral, but a step-down, a leveling off, a step-down, a leveling off, and we're having a lot of trouble gaining traction. I guarantee that this began with that emergency deployment readiness exercise (EDRE) that Scott did to Europe this spring. We had two weeks to prep and then he was gone and we didn't know how long it would be for...a month, three months, six months, etc. It ended up being only a month ("only" ha ha) but we didn't find that part out until after he was already there. We had prepared for the worst-case scenario of 6ish months. That began the downward trajectory. It changed how we were thinking about this house, how we thought about what was next in his career, and it changed potential plans for the summer. The EDRE did amazing things for his career but it cost me my sanity and cost him another deployment (3 in 3 years). Now, here we are, the first week in October, and we still haven't recovered. There are house things (always), vehicle issues (forever), and career questions (usually). I brought this up yesterday, as we sat at a restaurant eating breakfast in Laramie, everyone but me wearing their UW gear (yes, even Scott...I have a t-shirt but am in need of a sweatshirt I suppose). I didn't even have to dive into the flowchart explanation of EDRE > IVF > Wyoming > househunt > vehicle problems which all culminated in a metaphorical mudslide; he knew EXACTLY what I meant and he agreed. All that to say, this feels like a fall season that is completely different from others in the past. We are not where we expected to be, but we are not bad off either. It's a strange mindset. Last week, Scott blew a transmission while attempting to do a full DITY move to Laramie. It resulted in another week of him and the dogs sleeping on a cot and landed us short one more vehicle. The transmission will be rebuilt by him but it costs us time. And money, of course. But mostly the inconvenience of lost time is something money can't buy. Which is where a mechanic would come in handy, but then that is more money in labor for someone else to do something Scott can do himself. #inconvenience is the story as of late. This week, we got a moving truck, as the truck with the blown transmission is the one that was to haul the trailer. Saturday, we moved all the things we needed to up to Laramie and then went to a social function. This is not my spot to shine, as you're probably well-aware if you've read this blog for more than a few months. It was a gathering of the Hydrology department from the University of Wyoming. Raise your hand if you ever assumed that was something I would attend. Again though, it was refreshing (water pun intended) to not be around military people and to be out of Colorado Springs. These university people are so nice in Laramie. I talked to all kinds of different people, including PhD candidates from Kenya and India and a chemist who was an Army brat and went to school on Ft. Leonard-Wood (I taught for the school district that includes Ft. Leonard-Wood, again, if you've not read this blog for very long). Not to mention that there were dogs at this party and Laramie folks love their animals and, even after hours of conversations, not one person asked me how many kids we had. I almost had to pinch myself. It was a good experience and I would, on most days, like to just put a lid on the Colorado Springs chapter and make the move with all of our belongs, but I know that Laramie is temporary and the house we bought there does not have the kind of yard to support all of our farm equipment and hunting gear. So this is a definite state of limbo in a few different ways for both of us. But then we drove the moving truck back to the Home Depot in Cheyenne and I made the drive back home, listening to episode after episode of the Popcast. The dogs went duck-hunting in Wyoming. I got to work on school things and prepping for another week. I feel like I'm eighteen different kinds of behind. 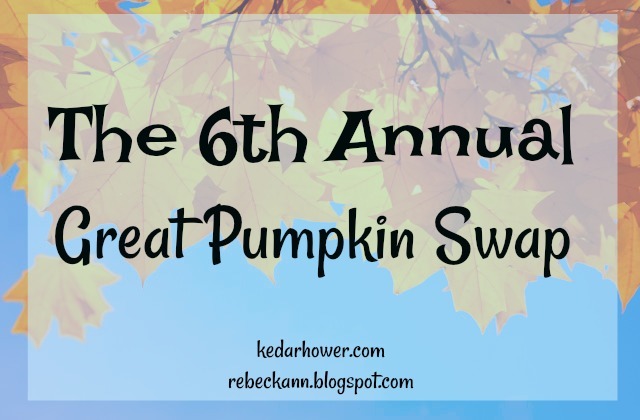 You still have all week to sign up for The #GreatPumpkinSwap! Sign-ups end this Friday night and we'll notify you with your partner by next Monday! Feel free to spread the word on social media! i hate feeling behind and in limbo. i'm sorry for all the inconvenient things, it's so hard to pay for something that you can do yourself. dogs at a party? sounds super fun. Isn't it funny how relaxed ppl can be when it's not your normal? :( Sorry for all the things that have happened! Hugs! This stressed me out just reading. It’s so hard living in limbo, and not feeling like you have a good routine. I didn’t realize you guys were moving to Wyoming! In limbo is not a comfortable place.